Hydrocephalus is the most common cause of abnormally large heads in newborns. It is a result of Ventricular enlargement with excessive Cerebrospinal Fluid (CSF.) It occurs when CSF production exceeds reabsorbtion; it is usually due to obstruction in the normal pathway of its pathways within the Brain. Most often it is due to narrowing or obstruction of the Aqueduct of Sylvius (also called the "Cerebral Aqueduct"), but may be due to obstruction at the CSF outlet passages of the 4th Ventricle (The "outlets are known as the Foramina of Luschka and Magendie.) Another cause may lie in the CSF reabsorbtion pathways surrounding the Brain Stem and Cerebral Hemispheres called the Subarachnoid Spaces. Blood in the Subarachnoid Space (from hemorrhage from any cause) or infection (a condition called Meningitis) may cause scar formation within the Subarachnoid Space and obstruction of CSF flow within this Space. 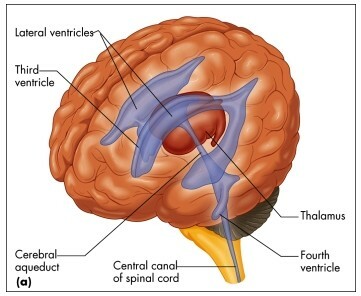 Hydrocephalus is classified according to whether the obstruction to CSF flow lies within the Ventricular System (Non-communicating Hydrocephalus) or outside the system in the Subarachnoid Space (Communicating Hydrocephalus). Communicating Hydrocephalus occurs when CSF flows freely into the Subarachnoid Space but encounters an obstruction to its flow pattern or reabsorbtion in the Subarachnoid Space. The "obstruction" may be "complete" (as happens in acute extensive hemorrhage or extensive infection in the subarachnoid Space) although it is usually "incomplete" which results in a differential rate between CSF production and CSF reabsorbtion. The consequence is a relative excess production of CSF which increases the pressure within the Ventricular System much like what happens when a child's balloon is inflated. Communicating Hydrocephalus is most often secondary to meningeal inflammation from infection or blood in the Subarachnoid Space. Non-communicating Hydrocephalus occurs as a result of a blockage of the CSF pathway at some point within the Ventricular system. This may be due to "Atresia" (failure to develop) of the Cerebral Aqueduct, tumors within the Ventricular System (such as Meningioma, Ependymoma, Medulloblastoma, Choroid Plexus Papilloma). "Megalencephaly" is another condition presenting with an abnormally large and malfunctioning Brain. Neuroimaging evaluation in newborns can include Cranial Ultrasound, CT scan, or MRI scan. Cranial imaging may show separation of sutures, areas of thinning of the bones, or intracranial calcifications (which are often associated with congenital infections). Among the disease entities that must be considered as potential causes of Hydrocephalus are intracranial "space-occupying" lesions (such as Subdural Hematoma, Porencephalic Cyst, Tumor, etc. ), all of which can be identified by CT scan. CT shows the Ventricular size and possibly the site of obstruction. Plain skull films may show a "beaten-metal" appearance of the bones (common in infants with Myelomeningocoeles and Hydrocephalus). This peculiar appearance usually indicates a prolonged increase in intracranial pressure. Ultrasound can define the degree of Ventricular dilation, and serial studies can document progression of the Hydrocephalus. Ultrasound is valuable after intraventricular hemorrhage, since Ventricular dilation may be transient and require only medical treatment. When congenital infection is suspected, it is important to consider obtaining blood serologic studies for Toxoplasma gondii, Rubella Virus, Treponema pallidum, Herpes Virus, and Cytomegalovirus. Examination of the Cerebrospinal Fluid (CSF) may be the best method to offer clues to the source of an infection. An electroencephalogram (EEG) may be helpful in patients who develop "seizures (Epilepsy). Treatment depends on the actual cause. Medical management with agents such as Diamox (acetazolamide) and glycerol or lumbar punctures (in cases where the Hydrocephalus is "Communicating") to reduce the CSF pressure may offer some temporary assistance. Surgical management becomes important, however, when there is progressively dilating Ventricles as documented on serial Neuroimaging scans. This becomes critical if the head circumference is increasing too rapidly. This operation is called a "Shunt" procedure which is designed to reduce the intracranial pressure. It involves creating a diversionary pathway from the Lateral Ventricle by inserting a special catheter into the Ventricle that is then connected to a special "one-way valve" apparatus which, in turn, is attached to a longer, "Distal" catheter. In most instances the Neurosurgeon will choose to place a Ventriculo-peritoneal Shunt (rather than a Ventriculo-atrial variety) with the "distal" catheter being inserted into the peritoneal (abdominal) Cavity. In this way the CSF is reabsorbed through the lining of the peritoneal cavity into the blood stream. Fetal surgery (conducted before birth while still within the uterus) to treat Congenital Hydrocephalus has not been successful. After the shunt is placed, the infant's progress should be followed with particular attention to the head circumference, neurological and intellectual development. Neurosurgeons are concerned for the increased risk of infections in the face of an implanted "foreign body" (the Shunt system). Periodic partial CT or ultrasound (if the Anterior Fontanelle is still open) can be used to monitor Ventricular size. While it is recognized that some children may develop to a point where they cease to need the shunt, the determination of this is quite difficult. In most patients it is preferable to leave the shunt in place. Hydrocephalus is often associated either with Dandy-Walker Cysts or the Arnold-Chiari Malformation which are major malformations of the Posterior Cranial Fossa.